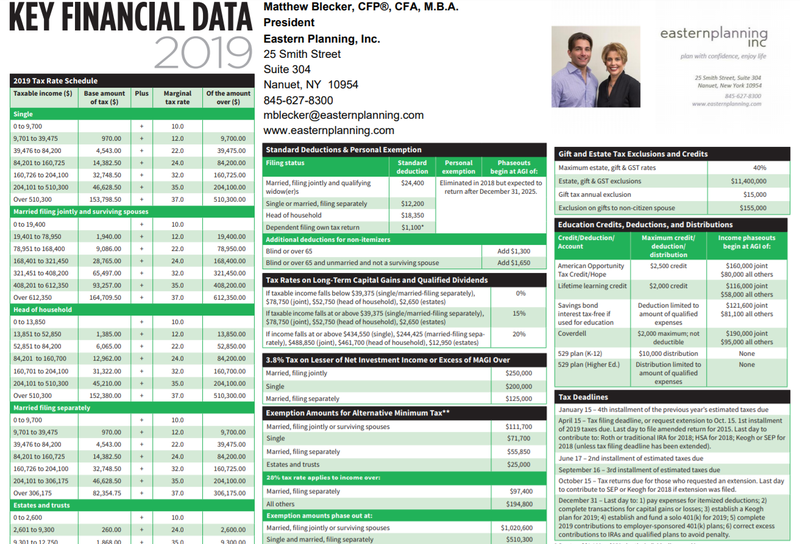 2019 Key Financial Data reference guide — Eastern Planning Inc. The 2019 Key Financial Data reference guide puts many important financial numbers right at your fingertips—in a simple graphic format. Post it to your bulletin board! Save time by providing easy access to financial numbers that matter to you. Manage your overall tax bill by using tax deductions and credits listed. Make informed decisions to avoid additional taxes and penalties. Spot tax-efficient opportunities to save for a comfortable retirement. Plan for health care expenses in retirement. Gain tighter control over your money and assets. Download your FREE guide on "Key Financial Data" now! Would you like a complimentary consultation? By submitting this form, you are consenting to receive marketing emails from: Eastern Planning, Inc., 25 Smith Street, Suite 304, Nanuet, NY, 10954, US, http://easternplanning.com. You can revoke your consent to receive emails at any time by using the SafeUnsubscribe® link, found at the bottom of every email. Emails are serviced by Constant Contact. If you would like to receive email communications from us, please provide your email address and we would be happy to add you to our list. Don't worry, we do not share it! Beth L. Blecker and Matthew A. Blecker are Registered Representatives of and offer securities products & services through Royal Alliance Associates, Inc. Member FINRA/SIPC, a registered broker-dealer. In this regard, this communication is strictly intended for individuals residing in the states of Alabama (AL), Arizona (AZ), California (CA), Connecticut (CT), Georgia (GA), Florida (FL), Massachusetts (MA), Maryland (MD), New Jersey (NJ), New York (NY), Ohio (OH), Pennsylvania (PA), South Carolina (SC) and Virginia (VA). No offers may be made or accepted from any resident outside the specific states referenced. Enter your name and email to gain access to our free whitepaper. Enter your name and email to sign up for a copy of this free book. This is the spare popup description.